The CPF Board do send out letters to those approaching their cohort draw-down age. The sly way they put it, is to suggest that you could delay your draw-down and receive more per month. I happen to opt for the CPF Life and somehow my enhanced top-up application had already stated I wanted my draw down to start from age 64. Tuck away in the middle of the FORM, is a line that tell you that if you didn’t indicate that you want to start your draw-down from age 64,or 65,the DEFAULT AGE is 70. * Comment first appeared on TRE June 11, 2018 at 7:50 am. « New citizens also need to VTO to enjoy life! Since when has the PAP been ethical? Hi LKW, long time no hear from you. Good to read your contributiin again. Welcome back. Hope this is not a one-off thing & never hear from you again. Election is coming, we need to work harder. The regime IBs have been activated & working 25 hrs a day to plp their master. We need more like-minded supporters to ffffffffffs them. Soon, they will just email you. Like iras. Notice is in the email. Go read among a pile of spams and junks. Plus free scams and virus. First we provide absolute power to single party. Then the parliament provide absolute power to the relevant agencies without the need to go back to parliament for major changes and decisions. Whose fault do we think it is (was). I only believe in a healthy system which able to correct itself without fear of men altering it to one own gain. Thus, are we in such system? No. as 70% of us (which is normal) are in dreamland and 30% of us are struggling to dream about a system that 70% doesn’t care. How to go about it? Educate your children, they are the only hope to make changes if not too late. I came from a family that believe the miw were best for the country… but now, 1/3 believe in alternate voice while 1/2 trust no politicians. My dad retrenched and unemployed for 14years while I was made redundant (new replacement word for retrenchment… haha…) since 4 years ago. Now my dad hates miw and while I had never believe in any politician since 20years ago. How much had change in SG? I say nothing much. Still thinking TCB can fix this bug in the system? Hilarious… the answer lies in the power of us being able to make decisions, and create unexpected results for the politicians. Why america is considered great by many? Because they can put someone like Trump in position and give you that long middle finger. We educate our children not to believe what we were shown or spoken but to find out and verify ourselves if we are interested in it. This is not only the tricky part but other administrative procedures too! I know of friends who have renounced their S’pore citizenship and writing in to withdraw their CPF including their Medisave medi-life etc…. It took them at least 3 months for everything to come through! One can surmise the reason behind it! inside 200m is not within 200m. it is unethical. but pap does it. INDIAN is malay. it is unthinkably unethical. but pap does it. since CPF is kosong, how can pap be ethical? cannot. one lie covered by a bigger lie. HDB rental unit is asset also can lie. WTF. ENTRAPMENT IS ILLEGAL AT LAW because consent of counterparty has been refused. In blunt truth, it is obtaining financial benefit by one party by deception and oppression. IN TRUSTEESHIP LAW DATING BACK TO OVER 700 YEARS OF COMMON LAW APPLICATIONS, there is no such a thing as trusteeship to perpetuity nor to mortality at the sole trustee’s usurpation of the trustee’s unlawful determination – the owner of the trust assets is denied of his exclusive quiet enjoyment of those rights – the legitimate owner might as well give it away to a thief or robber. If the contrary is true, than investment bankers can simply confiscate all the assets/properties of the investors and hold that to perpetuity to its advantage knowing that all investors have mortality and corporate entities like investment banking institutions survive to perpetuity unless and until voluntarily liquidated or forced into liquidation by unsatisfied aggrieved creditors. My friend died before he could withdraw his CPF. The one size fits all delayed withdrawal of cpf is stupid. Only smart people accept this logic? 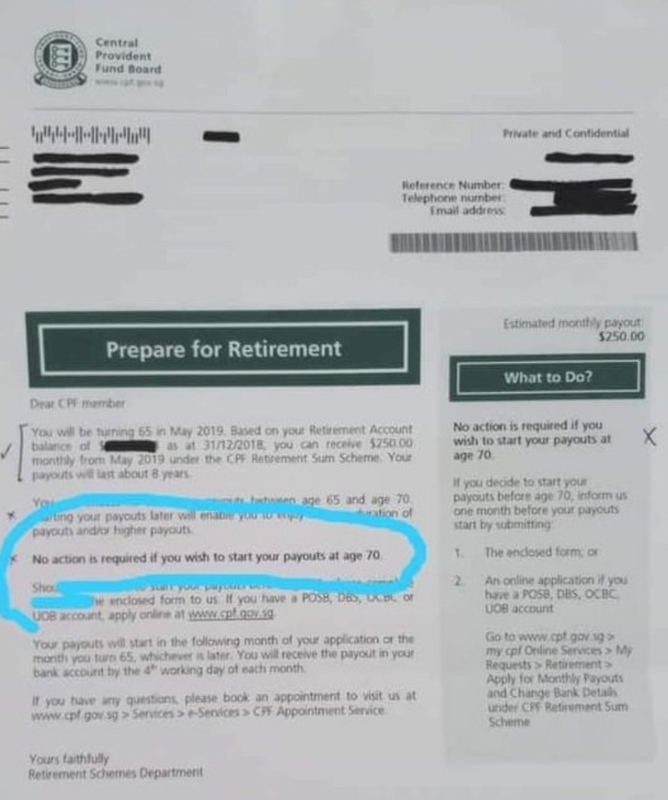 JUST RETURN THE LUMP SUM in the balance of CPF members – faithfully, diligently and without qualifications at 55, WE WILL ALL SOON DISCOVER how many senior (read SILLY) citizens put their retirement savings back in for the seductive 1% higher interest rate. AT LEAST CPFB INSIDE KNOWS who these SILLY citizens are even if the rest of us don’t know. They will have a BIG UPROARIOUS LAUGHTER OF WHO THESE COMICAL INVESTORS ARE inside the concrete wall of CPFB offices after that. In the past we trusted CPF board so much that we have no question to ask, check or doubt their honesty and sincerity. We understood that 3 months before people turned 55, they (automatically) received letter on the CPF money withdrawal date. There’s no evil act like this time, playing with words to con people and finding mean ways to prevent people from drawing money. WTF, CBT. one jump from 65 to 70.
some idiot said “helps to simplify the activation process for members” ? if white idiot could tok kok with this kind of language, imagine how ‘good’ the mentality of the leaders and its citizens lor ? simplify to withdraw at 70 only ? simplify ? more like burden lar ? to truly simplify is having the option to decide at age 60 of withdrawing either at 61, 62, 63, 64, 66, 67, 68, 69, 70 hor ? As more people read n inform their friends /families, cpf service counters may be working OT. good for them to give feedback..
Or were they strictly instructed on the “DONT ASK, DONT TELL” rule? What the hell is PAP hiding by being so cunning? Yes welcome Khuen Way, but how many of our 64 & 65 folks reads English and has email. Do CPFB wants to see these people at the Office with their children to interpret. Why not default with Pinky out of PeeM Opera. 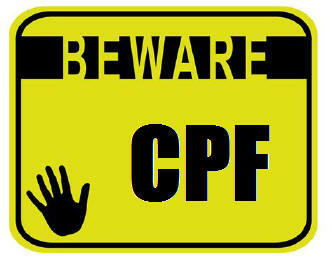 CPF rules change frequently without notice. I expect that in a few years time, the default will be raised to 75. If they get 70% again, likely the default will be 80 years old very soon. If I had forgotten the option form, and realised it only when I reached 65 years and 10months, can I still apply to withdraw or I am stuck and can withdraw only when 70 yes old? If the answer is yes, can I claim the arrears of ten months worth of cpf money which I had forgotten to collect? Does anyone know? It’s very important! We sillyzens are to blame..
After all these years we still believe that we have an honest gov in charge! Politics IS a dirty game after all, folks. Best you go down to any cpf branch office to enquire in person..get the officer’s name n destination for reference..
@Just fyi is correct. Go early bro and tell all your friends. And after that never forget to VTO comes GE. And tell all your friends too. It is the same as the CDC fund……….automatic opt in! It may be $2/- but it’s all gone x the no of sinky employees…….it probably run into billions…….all in the Pappies pocket. also make them look like big-time scammers. can otherwise behave so deviously. such people and such a political party? and a poor attempt at bribery too!! refuses to allow and accept criticism. It’s a rotten situation. which were all the receiver’s paid (excess!) taxes in the first place, hence ‘giving’ in quotes! Strange way to give because the giver always asks, on every occasion such ‘giving’ occurs or is about to, the receiver if he/she would like to opt out!… wtf?!! Shouldn’t it be an opt-in exercise rather? This has happened time and time again, over and over, that one has literally lost count! For the elderly who have more than $49,800 in ther MA with the extra amount spill over to their OA, they should withdraw every cent and do whatever they want with their money. Forget about the extra interest. With these idiots around, don’t leave a single cent behind. All in tune with foxy PAP. “Minority representation applies only at election time” ! An Indian can transform into a Malay. Tarzan can morph into a monkey ! A $2 company A.I.M. owned by PAP can buy over a software developed at $2.4Million (with HDB residents’ money) for $140K – from PAP-run Town Councils ! One very Good and kind, senior SGH Principle doctor help wrote letter for him to withdraw cpff on medical grounds. Wtf,…had to pay a few hundred dollars just to get medical records from SGH to re;ease to cppf. Took him 8 months to finally receive only 70% of his cpff savings released. 8 months ??? ?….lucky he still around after that 8 months of wait.! More horrific to know is….NOT 100% ….I say again….NOT 100% was released to him hor,…just 70% only !!! What kind of “Bank” is this ??? ?….even a dying man,..”certified dying” by a senior general hospital doctor….also “carry little weight” ??? Cpff “die, die” still want to “hold on” to 30% of his hard earned $$$$ ? Wtf,…so…”gian png ” ( greedy ) and “unethical” ! You people tell me ??? ?….what kind of “devils” have we “voted” ?? Q: What did the pioneer pap guy say to the 3g pap guy wrt cpf? Bapak, thanks for your comments. I still lurk around on and off giving my 2 cents worth. Yes! We need to put right falsehood planted by IBs. I dare say, Fake News, deliberate Fake News are mostly from the IBs. rukidding: You people tell me ??? ?….what kind of “devils” have we “voted” ?? In real life geological history, WHITE DEVIL is probably the richest gold deposit ever mined in Australia. This deposit sat near Tennant Creek, Northern Territory, Australia, grading 14.6 grams per tonne of ore rock – the average gold mine around the world now is only 1 gram per tonne. WHITE DEVIL is further enriched with high grade copper attached. For its endless greedy “owner”, namely Western Mining, it is a godsend rich deposit of harvest for exploitation to the fullest till the deposit drops dead from total exhaustion of mineral economic resources. CPF is something like this – PAPpys “WHITE DEVIL” gold-copper fabrication – even retaining the last drop of blood, sweat and tears of a dying man. This will never happens in Down Under solely on compassionate ground. CPFB should have engaged professional actuaries to do an estimate of expected life-span of those with chronic illness and allow them to withdraw their CPF at 55 without impediments.